Signature Cake Boards - Targit Sales Associates, LLC. The rising cost and reduction of effectiveness of advertising, along with the increased cost of many imprinted packaging programs has added financial stress to bakeries. The signature board program offers the best utilization of packaging and marketing resources. This high quality board is imprinted on 4 areas of the border. This means that your brand and logo is ALWAYS present while the cake is being presented and enjoyed. Everyone at the party will know where the cake is from…no more assumptions and guessing. People are posting pictures of cakes on their social media pages, and this represents a very effective way of getting your brand exposure to more people at a very low cost. The boards have a stock gold border on a white backing. It is then laminated, resulting in a strong “barrier” for your product. These boards represent a high standard, and quality image for your bakery. Your cake will stay fresher, look great, but also sell itself by having your brand on the board. 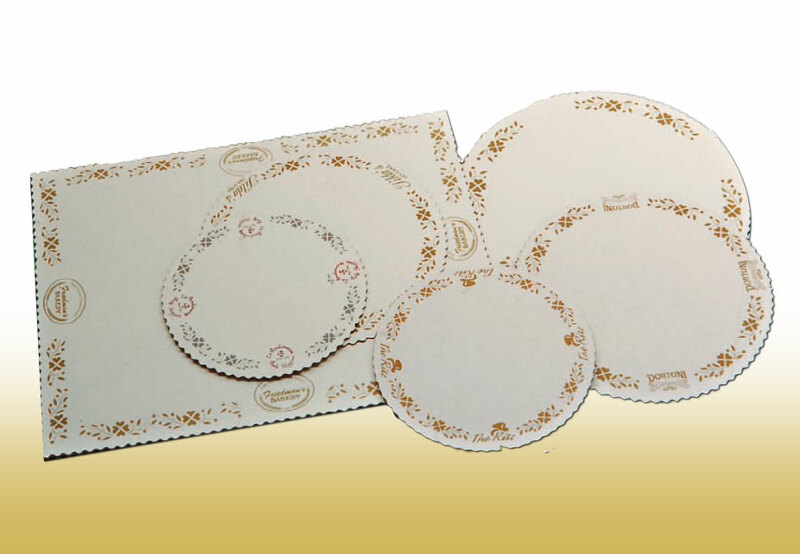 Targit stocks all of the popular sizes so you can have a consistent look for your cake program. Targit Stocks the “classic” design, but also can assist you in a custom printing program to help your cake program be successful. The Signature Cake Board program is not only a high quality Cake board, but also a very powerful marketing and branding tool for your business. A “Point of Consumption” form of branding. So long as the cake is on the table…your name and logo is visible.